The House of the Dead 2 is amazing, probably the best light gun game ever made. However Sega have released a new light gun game with a plot taken straight from the self destructing IMF briefs. For those of you who are familiar with the arcade version you will be pleased to note that many extra modes have been added to the Dreamcast Version. The standard arcade mode is joined by an excellent training mode, which is very addictive and harder than THOTD2 training missions. A special partner mode has also been added, in this mode player one can only shoot the pink people whilst player two has to shoot the blue people. It may sound strange, but this partner compatibility test is an excellent addition to the main game. Other modes that you open up will all be familiar to anyone who has played Virtua Cop. After finishing the game under various conditions you can play through the game with the enemies appearing in slightly different places. It has been widely publicised that this game is just too easy; this is an unfair statement for a couple of reasons. First those of us who have played any light gun game before will know the score, and in that sense we are already prepared if you get my drift. However worst of all is that the default continue setting is 9!! This you cannot change until you finish the game! 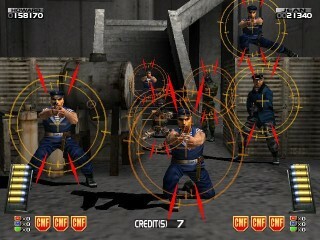 Changing the difficulty to hard or very hard and also changing the shooting area can make confidential Mission harder. Basically the shooting area controls how accurate your shots have to be, by changing it to 'large' if you fire in the vague direction of an enemy then you will kill him. I find the best set up is on hard with continues set to suit your ability and the shooting area set to small with the Virtua Cop targeting system set to off. Confidential Mission breaks up the shooting action with various route-altering challenges, these challenges are few and only deviate from the main path for a very short while. The first task is when you are trapped in a gas chamber and you have to equip your adhesive bullet to plug up the holes. Depending on how you do sets the next scene. If you plug up all the holes then you escape unharmed, however if the gas gets you then the whole screen goes a shade of green and will begin to distort and warp. When you are under the influence it is hard to hit the enemies especially if you have the shooting range to small. This is probably the best in game task that Confidential Mission has to offer. More of these would have been great. The Bosses in CF are much better designed than those in THOTD2. The first and third level shoot outs see you running around boxes and walls and exhibits trying to pick off the enemy, this is far more preferable than the standard shooting fare that THOTD2 offered. 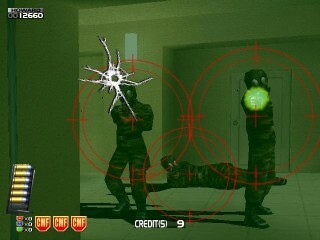 Confidential Mission's graphics are very high quality, which you would expect of a game that is 'on rails'. The environments are well constructed and detailed, and there are plenty of objects to shoot if you require. Many of the shoot outs happen in small areas, most of which have something blocking your line of vision if you the shooting area set to small this provides ample challenge. The voice acting is excellent, no not really it is as bad as we are all use to. Remember the lines in THOTD2 'My friends went inside, I told them not to go…aaahhh', well this time it is slightly better with the leading man Howard Gibson saying lines like 'That's how they operate' and 'There not here for the exhibits!'. Trust me you will be quoting these when you play the game…no you will. The rest of the sound is adequate with the gun shots sounding like what they should do, and the music providing some suitable atmosphere at key points. It has been suggested that light gun games should be made much longer, maybe even introducing save game positions in the middle of the levels. This I think would be bad, as light gun games are pure arcade fun; the idea is to get a high score and to relax after a troublesome day. The only problem I found with Confidential Mission was when I played with 2 people the game didn't always register my shots. This could be put down to a few things, first I have a jap dc gun, second the second player was using the madcatz gun and thirdly and most likely it is how the game registers the shots, as I don't have this problem with THOTD2. So should you buy this game? Well I would say yes, if you enjoy light gun games then you will enjoy Confidential Mission. It is not as good as The House of the Dead 2, but it is different, and that is good. If you have a light gun then you might as well buy this game to at least get some use out of it. However if it were a choice between Confidential Mission and The House of the Dead 2 then I would say check out The House of the Dead 2 review and make your own mind up. 8 Well detailed environments and characters, think Virtua Cop in Dreamcast pretty paint. Sound 7 Very clear sound effects and voices. Even if the acting is up to my high level. Gameplay 7 It’s a light gun game. You shoot people. Nothing more, nothing less. The training modes offer a substantial challenge. Games like this you buy because you enjoy them, it is not about finishing them and Confidential Mission is no different, the game is good shooting fun! Ah! Agent Smith we have been expecting you! hmm That’s how they operate!"